Bright yellow container ships call on the Port of San Diego every Monday and Tuesday. They’re owned by the Dole Food Company, and the ocean containers they carry are all branded with the familiar Dole logo. Perhaps you’ve seen its ships in San Diego Bay or one of its containers on a truck. Shouldn’t we be surprised to learn that an importer owns and operates its own ships? It’s probably not the comparative advantage for even the largest importers. And here’s the thing: Dole isn’t one of the country’s top three importers of containerized cargo. Instead it’s the fifth, after Walmart, Target, Home Depot, and Lowe’s. But you won’t see boxes or ships owned by these companies. Instead, they depend on carriers like Maersk, CMA CGM, and Evergreen to ship their freight. And if you think more about it, shouldn’t we expect Dole to be even less likely than Home Depot (#3), Sears (#6) or Dollar Tree (#10) to own container ships? After all, fruits are supposed to be seasonal products, while companies like Walmart could be using their ships all year round to import their products. Why doesn’t Dole simply charter ships or buy freight space like other carriers? The fact that Dole owns ships is all the more interesting given that a competitor, Chiquita, has sold its ships. Dole operates the largest refrigerated fleet, or reeferships, in the world. It can carry over 1500 TEUs, and its fleet includes the world’s only fully containerized reeferships. 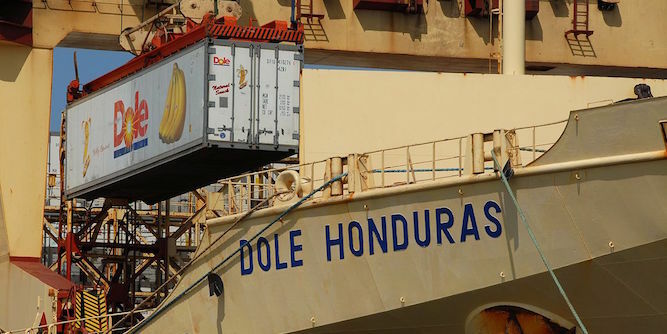 Dole owns a total of 19 vessels, and it currently operates four vessels on the West Coast: Dole Ecuador, Dole California, Dole Costa Rica, and it leases yet another. The trade is going well enough that it will soon be bringing even more ships online in the near future. What do these ships carry? Fruits, mostly: Dole is the world’s largest producer of bananas. It ships bananas and other fruits to San Diego from ports in Peru, Guatemala, Ecuador, and Costa Rica. Most of Dole’s imports go through San Diego, and it also has operations in Wilmington, DE; Port Everglades, FL; Gulfport, MS; and Freeport, TX. Its terminal at the Port of San Diego can hold about 800 containers. All of them are refrigerated boxes known as “reefers”: Each 40-foot reefer can hold 1000 boxes, and each box holds around 100 bananas. Dole discharges around 2 billion individual bananas and 16 million pineapples in San Diego alone. If bananas were a seasonal product, then it wouldn’t make sense for Dole to own and operate its own ships; why would it idle ships for the months of the year when bananas may not grow? As it turns out, bananas are grown year-round. Import transaction records reveal that bananas are imported on a fairly consistent basis throughout the year. Here’s shipping manifest data showing how much all banana shippers (not just Dole) import every month over eight years, provided by ImportGenius. You see that with just a few exceptions there isn’t too much fluctuation throughout the year. Next, nearly all bananas come from plantations in Central America. Ecuador to San Diego isn’t a very active tradelane: it’s nothing close to Shenzhen—Rotterdam, the world’s most important lane for containerized cargo. Dole would find it nearly impossible to get the service required to meet the needs of complex coordination of importing produce. 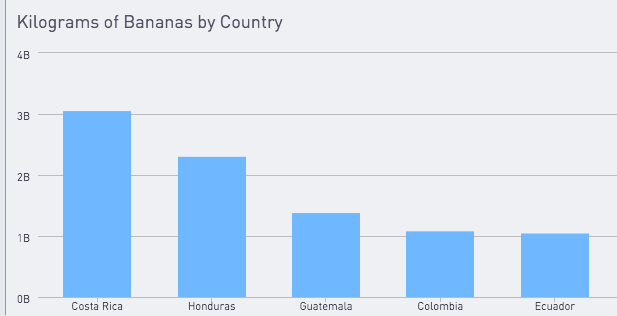 In addition, the countries that export the most bananas don’t have the world’s best-developed ports, in part because they don’t produce enough goods to return the investment in high-tech ports. Take a look at the picture of the ships themselves. If you’re expert on container ships, you may pick out a particularly interesting feature: Dole ships have their own cranes on board. This is again an indication that the ports that Dole frequents aren’t as well developed as it would like. Instead of having to rely on stick cranes in not-so-sophisticated ports, it has customized ships with on-board gantry cranes to lift its own reefers. That significantly increases efficiency by reducing time spent in port. It doesn’t stop at ships: Dole directly owns and operates some of the banana plantations in Central America. Fruit companies used to be textbook examples of vertical integration. Corporations like the United Fruit Company and the Standard Fruit Company used to control all stages of the production process, from plantation to market. In the latter half of the 20th century, these large companies have somewhat turned against vertical integration. Consider Dole’s competitor Chiquita, which sold its storied fleet eight years ago. Chiquita was formerly the United Fruit Company, and it operated a dozen vessels known as the Great White Fleet. The fleet was founded in 1899 by Minor Keith, who painted the vessels white so that they could reflect the sun and reduce spoilage of fruits. At one point in early-20th century, the Great White Fleet had 100 refrigerated ships, which made it the largest private fleet in the world. Some of these vessels even participated in the Bay of Pigs invasion to depose Castro in 1961. A half-century later, its parent company would find that it was no longer economical to own its own ships. In 2007, Chiquita sold the last 12 vessels of the Great White Fleet to two carriers for $227 million; it publicly stated that the sale would help with debt relief. Chiquita still charters many of these ships, but it’s no longer the legal owner. 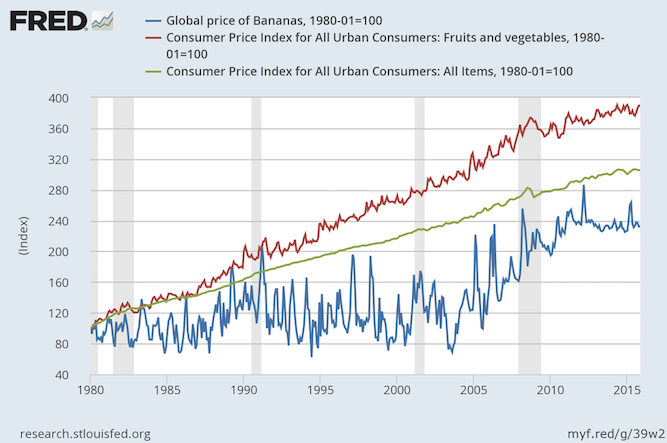 This chart from the Federal Reserve Economic Data below show two things about the global price of bananas: 1. Its global price has steadily risen, and 2. it’s been less volatile in the last ten years than in the twenty years previous. We’re not totally sure what drives these trends. Perhaps it’s less volatile because so much of the economy has been securitized. Perhaps it’s significantly affected by the price of gas. Perhaps prices are rising because of the deadly fungal blight that has been killing off the fruit. Or maybe there’s just so much demand for bananas because more people have developed a taste for bananas. In any case, it’s hard not to marvel at the hyper-optimized supply chain of the banana. Dole and Chiquita still operate their own ships (even though Chiquita is no longer the legal owner of its fleet). Figuring out how to transport bananas has played no small part in reducing price fluctuations and ensuring you have a steady year-round supply of America’s most popular fruit at your local grocery store.